It’s a difficult question, a question we tend to ignore in the sphere of contemporary art and theory. We, the establishment, find it rather naïve to ask such a blunt question. We are sometimes very unsure of ourselves as artist (why am I doing this? Am I good enough?? etc. ), but to question art in itself, thats really over-the-top. The most perennially popular category of art is the cheerful, pleasant and pretty kind: meadows in spring, the shade of trees on a hot summer day, pastoral landscapes, smiling children. This can be deeply troubling to people of taste and intelligence. 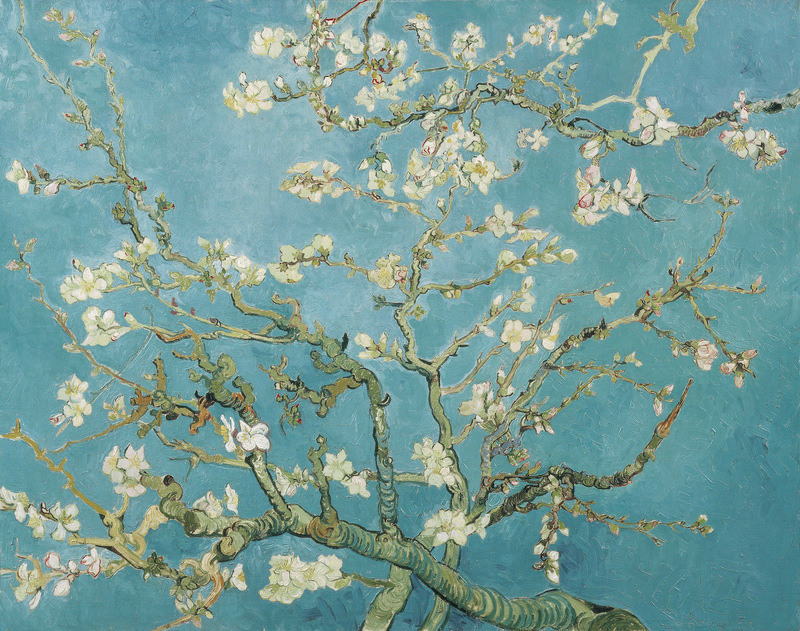 History tells us Van Gogh painted the Almond Blossoms paintings to celebrate the birth of his nephew and namesake, son of his brother Theo. Todays art establishment worries about prettiness, pretty pictures feed sentimentality. And we do not want to be sentimental, do we?! A legitimate question is therefore: Is Almond Blossoms a sentimental picture? Does it make us unaware of all the problems in the world? The complexities of life? The suffering? In short: Does the Almond Blossoms make us stupid? Or can it be that a painting like this rather enhances our ability to understand the complexity of the world, be aware of beauty, and of art’s possibility to capture an ever changing world in a single image – ? Art’s ability to enhance our senses? The authors see art as a tool, which has the power to extend our capacities beyond those the nature has originally endowed us with. While traditional tools often are extensions of the body, art is an extension of the mind. Art, says the authors, help us with psychological frailties. This one has representations that build a ‘number’ story around the image and the celebration of the child and such alchemical progress took place to perfect his presence where it became evident and expressed. Rav Chessed and the Almond Flowers carry this. The number of main branches carry this. The background colors carry the contributing vibration of this. It also carries forth the story of the blossoming of the barren staff. It is a choice to call oneself ‘elite’. As head art critic in a newspaper it would be false of me to pretend not to belong to an elite. I see and write about art for a living, just like a professional football player get paid to play, because he is in an elite division. I have, through my access to public media, the possibility to define what’s good and what’s bad. I believe it to be extremely important that people like me are aware of this! I can not choose to see my own critiques as unimportant. This is such a fascinating subject. Thank you for bringing this book to my attention. Art as therapy? In the cognitive sciences the creation of art has long been used as a therapeutic tool. I did a quick search on Amazon and found a rather long list of books on the subject. But this approaches art from the creator’s point of view, i.e. the creation of art has certain therapeutic value for the artist. Do I understand correctly that this is not the kind of therapy the authors intend? Their version of art as therapy is as it applies to we the audience? My amateur’s opinion is that art most definitely has therapeutic value. In fact I often wonder if this approach to a work of art inhibits my ability to appreciate art for art’s sake. I do not have the skill or background of the art critic, only my self-conscious desire to experience something…to feel one of, or some combination of, the 7 functions of art listed above. Perhaps this leads to a sentimentality that acts as a kind veil between myself and the work of art…an overly subjective response. Thank you for another wonderfully thought provoking post. I look forward to following your thoughts on this subject as I attempt to read and understand the book. 1. Yes, art as therapy for the audience. 3. The book is very well written; entertaining, witty, with lots of images. Placing this on my reading list. Thanks. Love to read your blog. Glad to be back posting and reading after being gone for a year. I see how I missed it, returning with a different perspective. Not protecting myself but braving reality. Art helps us escape. Art helps us sort. Art helps us discover. When then is it therapy? I certainly love the choice of painting. Certainly Van Gogh had a myriad of feeling and thought and displayed them in each painting as a gift to those who look and wonder. Much like every creative soul who expresses outward what is encased inward.